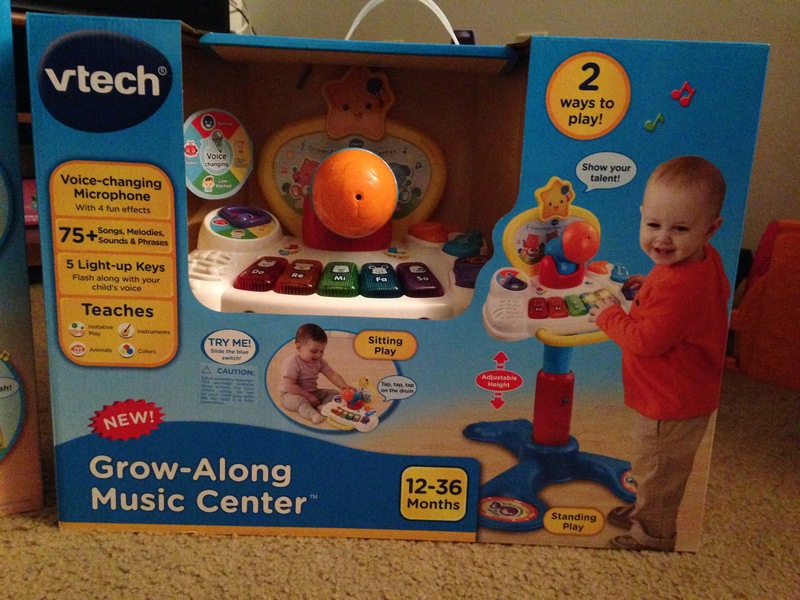 Recently, VTech sent me a box full o’ toys for Sophia and Maddie to play with. And, honestly, who doesn’t love coming home to a box full of toys on the front porch? First, let me say that the girls loved playing with them. They aren’t difficult to entertain, but they were really eager to break all four of these toys out of their boxes and get down to the business at hand–playing. While Sophia is just out of the age-range for each of these toys, she didn’t care. She wanted to play with them–and did play with them–just as much as Maddie did. 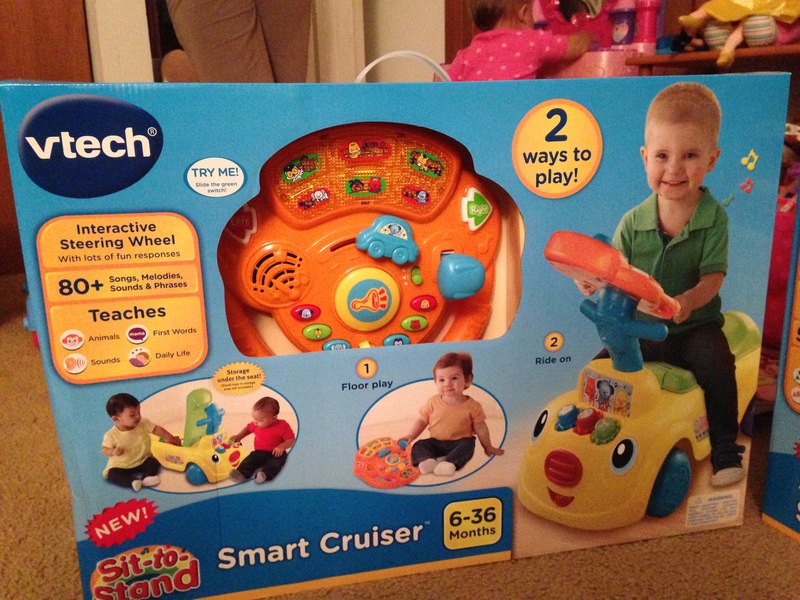 So without further ado, I bring you a review of each of the four toys that VTech sent my way. 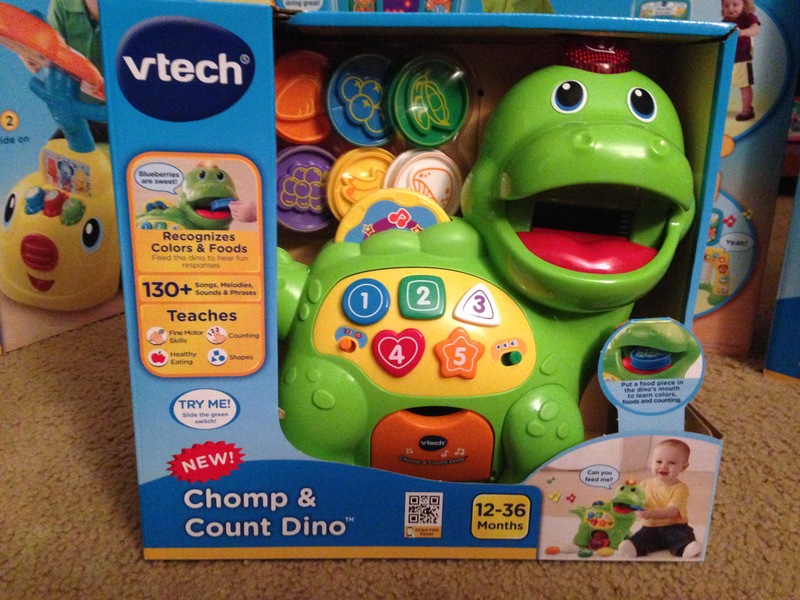 The play pieces fit into the Dino’s mouth easy enough and the buttons were bright and easy to press/play. The string attached for it to be pulled around also worked great. The lone fault that I found with this was that the trap door that should hold the play pieces in the Dino didn’t stay shut all that well. Could have just been a loose piece, but I’m not sure. The thing that I love about toys like this are they really encourage counting and learning colors. For that, this really did the job very well. Below, you can read what the Sit-to-Stand Smart Cruiser should do for your children. To be totally honest, this one got the most use out of all the toys that were sent our way. 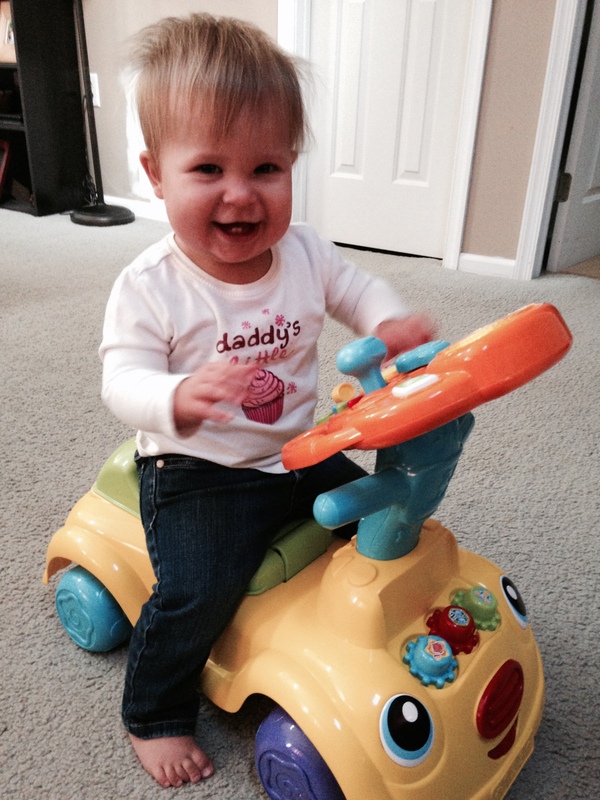 Sophia loves riding on anything car and/or bike-related. And, it was a great learning tool for Maddie to get her first experience riding on. I loved the fact that the interactive steering wheel can be used both on and off of the cruiser. It made really easy for Maddie to play with, while Sophia was able to roll around the house on the cruiser, itself. Assembly was relatively pain-free. And, it was pretty lightweight, so even when Maddie or Sophia weren’t riding it, they could easily push it around the house. 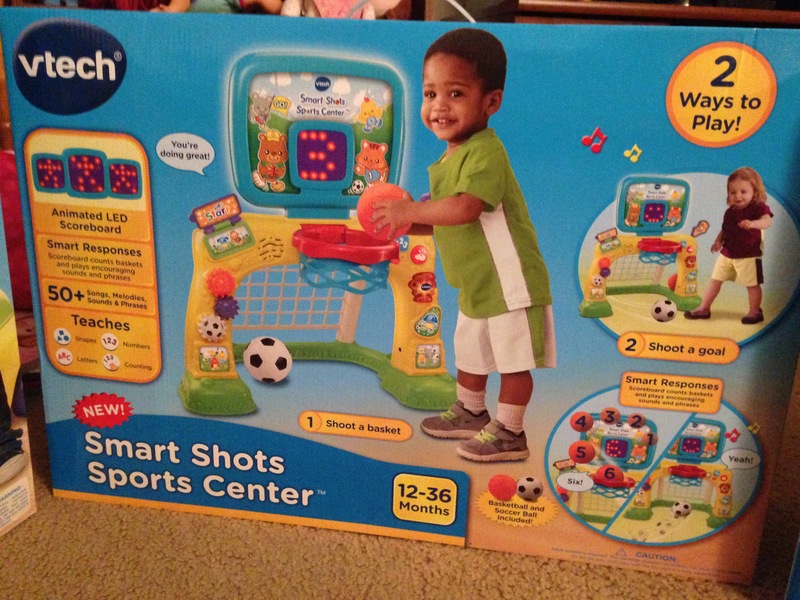 I actually really loved the Smart Shots Sport Center. Assembly was pain-free and quick. And, once we got it assembled, we enjoyed kicking the soccer ball into the net and dunking like crazy on the basketball hoop. These kinds of toys usually score pretty high with me, even though they’re made for smaller kids. It helps kids learn to throw, shoot, and kick a ball, and this one did just that. Sophia is at a point where she loves throwing and kicking, so having this is great for her. The balls were rubber and very lightweight–so they’re easy for small toddlers and bigger toddlers to play with. I’m not gonna lie, Sophia could NOT wait to get this out of the box. She’s at a phase where all she does is sing and sing “Let it Go” REPEATEDLY, so I knew she’d love this one. She actually sung into the microphone before we even opened the box. The height is adjustable, so it worked great for sitting and standing for both the girls. My only real complaint that I had with this one–and I don’t know if you can really call it a complaint–was the sound on the microphone didn’t get very loud. You can learn more about the toys by checking out VTech’s website, following them on Twitter, and liking them on Facebook.